Rear-End Accidents | Nashville Car Injury Lawyers The Law Offices of John Day, P.C. A rear-end collision occurs when two vehicles are heading in the same direction on the same road, and the trailing vehicle runs into the vehicle in front. Although this type of accident most frequently occurs in cities and towns with stop and go traffic, drivers also have rear-end accidents on faster roads like freeways and highways. Most often, the driver in the rear is totally or primarily at fault for tailgating, following too closely, or not paying enough attention to see that the driver in front has stopped or is slowing. 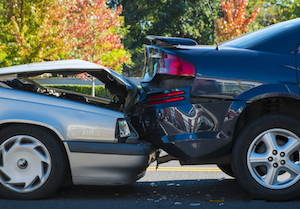 In busier traffic areas, a rear-end collision can lead to a multi-car pileup, with the front vehicle being knocked into collisions with other vehicles. Injuries from rear-end collisions vary. For example, the sizes and speeds of the vehicles, the positions of the people inside each vehicle, the age and health of the people, and the parts of the vehicles that are actually struck can all affect the severity of any injuries. Injuries can range from neck and back pain, whiplash, spinal disc injuries, rotator cuff tears and other serious injuries or even death. Tennessee requires every driver to do what is reasonable and safe under the circumstances to prevent an accident. From a common-sense standpoint, that includes driving at a safe speed, keeping a safe distance from any cars in front, and keeping a proper lookout in case the driver in front slows or brakes. The Tennessee Legislature has also passed some specific laws to prevent rear-end collisions on any public road. One law, Tennessee Code Annotated sec. 55-8-124, makes it illegal to follow more closely than is reasonable and prudent based on speed, traffic, and other road conditions. Another law, Tennessee Code Annotated sec. 55-8-136, mandates that operators of motor vehicles must devote full time and attention to driving in order to avoid endangering anyone else. Those laws can be used in court to help prove a driver who rear-ended another was acting negligently and is responsible for any resulting harm. Of course, not every rear-end collision is 100% the fault of the trailing driver. If the driver in front suddenly merges into the rear driver’s lane, cutting off the rear driver, then the driver who made the sudden lane change may be partly or completely at fault for the crash. Similarly, the driver in front may be responsible for a rear-end accident if the tail lights or brake lights on the vehicle are not working properly, which makes it difficult for the trailing driver to discern the other vehicle and its operation. Every case requires careful consideration of the specific circumstances, and Tennessee law recognizes that more than one person can be at fault for the same accident. For example, if a driver has their vehicle serviced and the mechanic carelessly fails to repair the brakes, the mechanic may also be partly to blame if that driver is unable to stop in time to avoid an accident. The lawyers at the Law Offices of John Day have handled a variety of rear-end collision cases. We have successfully represented clients who were rear-ended by tractor-trailers on Interstates where the truck drivers refused to admit fault, clients who were stopped at traffic lights or in a line of cars when a vehicle hit them from behind, and clients who lost family members in rear-end accidents. If you or someone you know has been hurt in a rear-end accident, contact us for a free case evaluation. Call us anytime at 615-742-4880 or toll-free at 866.812.8787. We only get paid if we recover money for you and we advance all case expenses so you are never out of pocket any money for pursuing your rear-end collision case.